BERLINALE GOES KIEZ: THE FESTIVAL IN THE CINEMA AROUND THE CORNER – Art, Food, Travel and Fashion! Berlin has a unique landscape of cinemas. Thanks to the strong commitment of their operators and the appreciation of movie-goers, arthouse cinemas are invaluable locations of culture, communication, and creativity. To mark the 60th anniversary of the festival, Festival Director Dieter Kosslick presented Berlinale Goes Kiez in acknowledgement of the superb cinema culture fostered by arthouse cinemas throughout the year. Since 2010, Berlinale Goes Kiez has honoured the vibrant diversity of cinemas throughout the capital and surrounding regions by featuring one local cinema as an additional Berlinale venue on each of seven consecutive evenings. 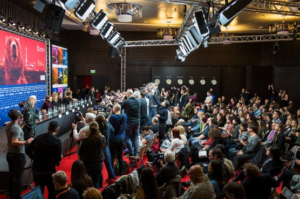 From February 9 to 15, 2019, when the Red Carpet is rolled out in a different neighbourhood daily, not only the film teams will be in the limelight, but also the cinemas themselves and their visitors. For its tenth anniversary, Berlinale Goes Kiez is returning to several movie theatres it went to in its first year, as well as visiting three local cinemas for the first time. renzlauer Berg. As the city’s smallest cinema, it provides — almost daily — very direct exchanges with guests from the film industry. In City Kino Wedding, the spacious 1960s foyer invites visitors to linger and enjoy a premiere-like atmosphere. Its programme with the latest arthouse films, cinematic treasures and cult films is complemented by select collaborations with local institutions, as well as a number of film festivals, retrospectives, and special series, such as “Cinema Culinair”. Situated on the fifth floor in a back courtyard in Kreuzberg is Sputnik Kino. On two screens it presents arthouse and independent films, documentary film programmes and children’s films, as well as new European and German cinema. An on-going attraction are the many readings, exhibitions, and concerts in the cinema bar. With good reason, Kino Union ranks as a classic among Berlin’s local cinemas. As a true Friedrichshagen institution, it is also the first address for film culture for visitors from outlying areas. In 2010, the very first Berlinale Goes Kiez screening was held at the Odeon, Berlin’s oldest cinema to show films in their original English version. And so, for the tenth anniversary of this special series, Berlinale Goes Kiez is returning to this movie theatre in Schöneberg. In short video portraits, the operators and managers of this year’s local arthouse cinemas invite you to come and get to know their venues. With anecdotes, they also provide insight into everyday life at these theatres. Along with host Anne Lakeberg, they will welcome visitors and international guests to Berlin’s neighbourhoods during the festival. ← Snow Patrol going to rock in The O2 on 26 January 2019.